A few weeks ago I published a post about falling into a trap of following developmental charts and how they can provoke unnecessary anxiety or rivalry. The post focused on external pressures which may prompt parents to seek advice or get worried without any clear reason from the child’s side. I keep thinking about this matter and recall real stories when parents had a dilemma whether to seek an advice or not. They were realising that their child develops a bit slower then other children in certain area and each family was taking different position on this fact. It is a very complex and delicate matter and it surely engages a lot of emotions, some of them might be not that visible at first. There is no advice which would apply to all of these families. Each parent and each family need to do their homework and try to understand their particular case, then act to their children’s best interest. Sometimes parents don’t realise how anxious they are and this anxiety determines their action. And it can go both ways: they might become overwhelmed by it and won’t seek any advice or further diagnosis – being too afraid that something wrong is going on. Or just opposite – they might be running from specialist to specialist, searching for an answer which in fact lays just in front of their eyes. I witnessed the situation in which parents were preoccupied with their daughter being much smaller than other children. They were performing complicated tests looking for hidden abnormalities (including very expensive genetic analysis). All turned out to be fine and the daughter lives a happy life, despite being very petite (exactly like her grandmother used to be). Let’s imagine we have a dilemma whether to seek advice or not. We have the knowledge available to us – from books, magazines and online publications. We observe our children with our caring and loving eyes. We do seek evidences that all is going well. Then we spot some signal that might worry us – child’s motor or sensory development doesn’t seem to be as fast as other children. How can we know whether it is just the child’s nature and her own path of development or there is something we should have a closer look at? What can help manage our own emotions to allow us to make the right decision? Use the right source of knowledge – child development studies are very advanced nowadays and we have access to knowledge which helps us to understand our children’s developmental issues. If looking at the growth or development charts or statistics of any kind: read them properly: take all range of results into account (see my post) rather than only average result which is inadequate in assessing our children’s’ progress. Avoid posting real worries on large forums for parents – as you get all sorts of contradicting information which will only make you more confused. 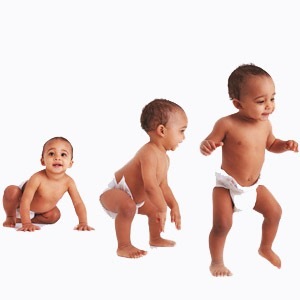 Observe your child – learn to know and accept her/his own phase of development. Think about environment you provide for our child to grow. What skills development are you supporting the most? Don’t judge, just look at your lifestyle as your children’s world and try to understand how it impacts them. Sit with your emotions – what is it that you feel about the possible issue? Are you worried? Are you avoiding this feeling by pushing all bad thoughts away and not even considering any further actions? Are you criticising yourselves for being too cautious? What is really going on within and for yourself? Decide who you can trust, a friend, a partner, an experienced relative? Who can you talk to about this, who will give you an honest advice, not only about the issue, but who can also help you manage your anxiety. Be aware of external influences. We have some knowledge which might be helpful but might be intimidating at the same time. We have a social network which can be precious but can put unnecessary pressure on us – fuelling rivalry or anxieties. We have family which wants best for us and our child but can also pass on expectations which we are not comfortable with. It’s important to know these possible influences and learn to protect against them.